A group of five enterprising civil engineering students spent spring semester designing a pedestrian bridge for a busy intersection in West Lafayette. The project was undertaken for the civil engineering senior capstone course (CE 498), which gives students real-life experience as they work in a team to confront design challenges. The bridge, a cable-stayed design featuring a brick and concrete facade, would be located at U.S. 231/IN 43 (River Road) and IN 26 (State Street), a site with a lot of pedestrian traffic between the Village and the Levee shopping area. As with many construction projects, the students had to pay special attention to environmental issues, from regulations and permits to the effect of the bridge on the local ecosystem. Josh Schenko, who will join Hunt Construction in New York after graduation in May and will work on the new Mets baseball stadium project, says at first he didn’t think the small size of the bridge site would involve many environmental considerations. However, he says, “once we started to research the area and state regulations, we found there was actually a lot of information to consider.” Among the issues: underground storage tanks left on the site by a former gas station, runoff, noise pollution and vibration issues, and possible effects on the Indiana bat, an endangered species. In addition to more obvious environmental issues, the students were asked to consider large-scale environmental impacts of civil infrastructure projects, according to Suresh Rao, Purdue’s Lee A. Rieth Distinguished Professor of Environmental Engineering. Topics included the assessment of materials used, cost-benefit analyses, loss of prime agricultural lands, wetlands and wildlife habitats, socioeconomic impacts, and historic and preservation issues. “These larger considerations are more important as components of required environmental impact assessments when larger-scale construction projects are being developed, especially when significant federal resources are involved, such as with federal highway construction,” he says. Michael Madar, who plans to work in the transportation sector, says his experience with the capstone project was a good introduction to the type of group work he expects to do professionally. Teammate Schenko agrees. “The project is a great culmination of all that I learned throughout my education at Purdue and also allowed me to expand on things I learned and integrate them into a final product,” he says. 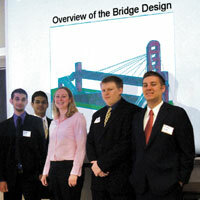 In addition to Madar and Schenko (shown above right and second from right, respectively), Team 4, which undertook the pedestrian bridge design, included (from left) Perry Pinto, Gaurav Sant, and Katie Haggard.